I arrived at stores after running through the instructions on how to get there about fifty million times in my head and with enthusiastic encouragements like, "you're going to have a great time!" ringing in my ears. I knew that already of course, though I was nervous. Mainly though I was pretty damn excited. Packed my kit quite haphazardly because being an absolute fresher (except for going to a few tree- training sessions) I had no idea what to expect or what caving really involved! On the minibus the excitement of the group was quite catching, I found myself smiling a lot, until I started to feel ravenously hungry and had to buy a sandwich from a service station to keep from gnawing my arm off. Eventually we were at the lovely warm Belfry. I loved the atmosphere there, particularly all the old signs on the walls -- made me wish I had some for my room back at uni! I rolled into bed at about half one, much to the chagrin of the Bristol Exploration Club members who had joined us. I only had a lightweight sleeping bag with me and so I proper regretted not wearing any socks for bed -- won't be making that mistake again anytime soon. Wow, Swildons is one wet fecking cave! The idea behind this team was, each of us had done the round trip once, but couldn't remember it very well, so in theory between us we'd be ok, and James turned up on his bike just as we were 'getting ready', but he hadn't done it. It sort of worked though, the only exception was we went down Vicarage Passage instead of the Landing, fortunately we bumped into Tetley, waiting for us, like some spiritual guide. After exiting we walked back in the crisp night air, under the bright stars, through ice-covered pools, Thomas and James drinking Carlsberg...Thomas clinging on to a carrier bag of more Carlsberg as he deftly negotiated fences. PS. I swear I didn't drink much of Nico's friend's granny's 'calvados', but my head hurt for the whole of this trip. Crossing a couple of beautiful fields in the middle of the country side, saying hi to horses that must have been a bit worried at the sight of a group of bright yellow men we got the cave entrance, I headed down with Simon (fresher but no first time caver), Nico and Jarvist as our cave leaders. Hooray! As a first time caver the entrance seemed quite daunting and after expressing my fear as I could feel that it was going to be a pretty intense experience, Jarvis with kind words helped me to feel like everything was OK and even though I was not entirely convinced (at first) I have to say that I quickly started to enjoy the experience. Going roughly 160m down in hearth, or mainly rock, we followed the stream (quite wet and splashy) which was fun. Got the ladder fine and followed the rock gap deeper with sometimes water up to the knees. Then the first 'trouble' turned up. Here the trouble can also be called sump or as Wikipedia nicely defines it: "A sump is a low space that collects any often-undesirable liquids such as water or chemicals. A sump can also be an infiltration basin used to manage surface runoff water and recharge underground aquifers." Sounds great but it was not actually that disgusting...I hope! -Get yourself very wet, become one with the element. -Once in the water wiggle around to get rid of the water in your overall, might require your team to tap your back -Grab the rope and don't let go -Go head first (avoiding bumping your helmet too hard on the rock) and pull yourself to the other side. Then you regain paradise or the delicacy of another chamber. We stop a little to take photos and headed up leaving the water stream (that end in The Wookey Hole) behind us to the unknown that was waiting for us at the top of a slope with the help of a rope. Then the real 'trouble' started for me or maybe the 'fun' for experienced cavers that love to be squeezed in a pretty tight space. After a couple of turning back since we were really on the expected path and a couple of ducks (same as the sump but this time you are allowed about 10 cm of air gap for you to breath as you are bending back to pass through the submerge passage, a bit like the famous limbo dance) we found ourselves in a bit of a biggy when the next duck was a sump and since we were on the 'right side' (being right is here quite relative) of the sump we could not use the sump pump.I could then feel that my caving team would happily stay there waiting for Tetley's team to come from the other side of the sump to then carry on our exploration. As we stopped I started to realise where I was and how quiet this place be and felt a little as if I was not really supposed to be here. So after 3 hours of cave experience, a sump and two ducks I turned out to be a real girl and asked my team if they would not mind going back the way we came in since I started to feel a little panic, in control but not too confident anymore. After 4h30m of caving, we recovered the surface in the warming sunshine! NO NO NO that did not really happen. It was dark, it was cold and as we were walking through the fields back to the hut a feeling fulfilment grew inside me. The hut was lovely to regain after a wet trip, everybody smiley even though tired. In the morning when we woke we moved all of our stuff less than five minutes up the road past the Mineries, to the home of Shepton Mallet caving club. Not so many signs but a much more homely feel with photos on the walls, a nicer bunk room (sorry Belfry) and a 'I predict a diet' hole in the door that provided some entertainment. I didn't attempt it, which probably makes me uptight but I knew my chest wasn't going through that without some pain! Had a really good fry up for breakfast - the mushrooms were beautiful. Then the groups were sorted out. There was Clare, Alex, Kate, Liane, Tony and I, and Jarv with Nico, Simon and Marionette (they had the 'French connection'). Jonny and Eric went with Tetley to do the short round with excursions that I was glad to not even be considered for (other than being a bit sad to not be doing a sump) because I think I would've actually died. All togged up we headed to the entrance of Swildon's Hole. Inside the cave I possibly didn't get off to the best start when I tried to slide down one awkward part of the rock, couldn't find a foothold and slipped instead; was helped down by a couple of people and told to not just go headlong into climbing down without checking for a foothold. Take your time, I was told. I knew I'd done it wrong so I was happy to accept the slight rebuke. The first real challenge was Jacob's ladder, although after being told to use the wall in front of me as my opposition I got down without a fuss. At the bottom of Jacob's ladder the main passage was fairly easy and filled with clear pools of water and a few nice rock formations. We made our way along to the Twenty Foot Pot where there was a lot of explaining on how best to descend, as the ladder rests against the rock at the top of the pitch. I felt quite frantic, being afraid of heights, and I wasn't even nursing a hangover like some! On the ladder itself (well, once I'd gotten onto it which felt like a trek and a half) my arm got crushed between the ladder and the rock wall, giving me two lovely bruises to show off to my friends after getting back to London. Alex lowered me down quite a way after I got stuck which possibly made things even worse because I didn't believe that the rope could support me (irrational I know). Twenty feet never felt so far. At the bottom I was very shaky; and so we carried on after watching Alex abseil somewhat wildly down the pitch. We squeezed along to some waterfalls that needed to be climbed down (if I only knew what each part of the route was called -- Ed: Double Pots) and I was fully baptised as a son (daughter technically) of Mendip on the second pool; I basically just jumped in after not knowing quite how to get down. Probably a bit reckless but fun anyway. Who knew that visiting White Scar caves with school at the age of ten would lead to this? Things got wetter after that. More waterfalls, more of my being well amazed by how easy Clare and Kate and Alex made everything look. While munching on some chocolate we met Thomas and company in Tratman's Temple looking for the Mud Sump; and not long after we decided to turn back. I didn't feel 'sporting' enough to attempt to continue down towards the first sump and I was worried that I'd run out of strength if we didn't start heading back - a correct guess as it turned out. In the end I think everyone else could have gone much further and done a lot more than me. I was just holding everyone back! We clambered back the way we'd come. In a lot of ways it was much easier to go up than down because I could see where to put my feet, but in other ways it was more difficult because starting some of the climbs required lifting my feet to places that my legs just refused to let me go. My energy was definitely starting to leave me, a scary sensation if ever there is one. There was a lot of Alex giving me a leg up to get me started! Going back up the ladder was fine at first (I wasn't even frightened, just a tad apprehensive - after all, I told myself, you've got no choice and that's a good thing) but then my energy was really sapped at the top because my left foot which I wanted to use against the rock was on a rung and I couldn't find a rung for my right foot. There were a couple of times where I was hanging off the ladder and my arms were supporting my whole body and hello, my arms are too weak for that. I was literally knackered by the time Clare managed to help me haul myself up, and miserable for having epically failed at climbing the ladder. I had nothing left to give. Yet again though after struggling to reach a spot where I could sit down for a minute or so, there was a little part of me that was well happy at having achieved it. I could've done with a cuppa but more chocolate sufficed, thank you Clare. Half a malt loaf on and we got a bit lost on the way back - Kate told us that if we were worried we shouldn't be because that sort of thing happened all the time. I wasn't worried. I believed that someone would find the way out, and I didn't have a clue where we were anyway! Alex knew where we'd gone off-track so we found the way back. Up a waterfall we went, then towards Jacob's ladder. Were it not for Clare and Tony's lights I would have missed it completely. By the time I'd failed to successfully climb up yet another part of the cave without help, I was resigned to the fact that I was physically wrecked. Even though Clare and Alex and Kate all told me at one point or another that experience helped and that as long as I was keen I reckon some degree of physical fitness helps, even if just for peace of mind. We then debated a bit on where the entrance was. Clare found a way via another little waterfall, once again making the ascent look easy. I struggled up that and then eventually managed to follow her up and out of the cave into the dimming light of the day. I had to be amused when I saw the stream outside Swildon's again; it looks nothing like the water I became intimately connected with underground! We squelched back to the hut and changed slowly, because not changing on a road means you have the luxury of taking your time. I was half-tempted to go and stand in the drying room for an hour to warm up, but the task of chopping vegetables for the pasties we were making for tea beckoned. Four hours later we tucked into some gorgeous self-made pasties and proper good apple crumble, and I stood in front of the fire for at least half an hour before going to bed, where I slept like... well, like a caving fresher who's just finished their first caving trip! It's so different to everything else. There's nothing like it. When Nico had said on the minibus that caving was amazing, I now knew what he meant. Swildon's short round - Nathan, Martin, Ste, Chris, Bruce and Dan. After the previous night's later than planned arrival, there was a somewhat slow start on Saturday. The Manchester contingent had arrived in the early hours, so we decided to leave them to sleep while Nathan, Martin and I went in to Cheddar to hire some kit. A considerable faff later, including a visit to the cider shop to stock up on supplies, we returned to the Shepton to gird our loins. After another faff, every one was suited and booted and we set off, a 5 litre bottle of cider in tow to be left on the surface. We waited while Martin went off to the bushes for a few minutes and then entered the cave. It was Ste's second ever trip and Chris and Bruce's first. There was plenty of water in the entrance, so it was with an air of bravado, but an undertone of trepdiation that we all descended. A short round trip was the plan, but Nate was the only member of the group who had ever done it before. We arrived at what we thought was Chapman's Temple but after a fairly exhaustive search for the way on, we concluded that we were not in Chapman's Temple after all. Our navigator's confidence shaken, the consensus was that we were unlikely to find our way round and should therefore just head for sump one, mess around a bit on the other side then head back. At this timely juncture, Tetley and his small entourage of specially selected freshers appeared around the corner.He took us to the real temple and gave us a few salient tips for route finding that would surely come in handy later. As we approached mud sump, the Manc lads seemed to become a little apprehensive. There was a definite air of "what the hell have we let ourselves in for". Once through the duck however, this evaporated instantly, with much cheering and whooping all round. We passed the troubles with little trouble, although I had an unpleasant moment when I went the wromg way through the third one. Suddenly my light hit the roof and my face was forced under the water. A quick reverse, a splutter and a bit of swearing later, I was through and we continued. Tetley's tips for passing the muddy chimney had proved invaluable. Once we were through the last of the ducks however, we came up against the other classic short round navigational gremlin. Dspite Tet's directions and its presence on the floor right where we were sitting, we couldn't find the route down into the stream way. Nathan went back to try and find the way on that we must have missed. In the mean time, Martin and I slipped down the hole in the floor and found the stream. We went back to get the rest, and I smashed a tooth turning round in the squeeze. I sat and spat out bits of enamel while the others ate some chocolate. We were starting to cut it a bit fine for our call out and Nate was still nowhere to be seen. With growing anxiety we called out for a while. Finally, an "Ayoh" found its way back through the gloom. He'd gone back through the last duck and returned to find that it had re-filled. Very relieved, we continued and soon found ourselves at sump one. Nate went through to set up a camera. Three tugs came down the rope and we followed, with someone swimming face down for several extra meters on the other side as the video attested. In high spirits. but running low on time, we headed for the surface. When we reached the bottom of the ladder we decided that Martin and I would hurry out to get back in time for the call out, while the others would de-rig and follow. We emerged a short while later and after rather a chilly walk, got back to the hut with a few minutes to spare. The others returned about 20 minutes later and we were all gorged on some rather fine home made pasties. This was an absolute top Sunday trip, nice and dry, and it took 3hrs exactly to navigate our way around the 'round trip'. We had no idea where we'd get to beforehand, but we brought the guidebook (minus points for muddying a guide book! apologies), a tackle sac with a ladder (which we didn't use) and the urge to explore! We spent time route finding, the cave description required reading at least three times before making sense, but without it we wouldn't have got very far at all. The Upper and Lower Traverses, and Hallelujah Pot, were unique challenges, in places they look too narrow but the black rock is so slippery you slide through easily. But like a fly into a pitcher plant you find you've been beguiled - as you try to go across-and-up the 45 degree bedding plane you sprawl and flail your limbs for purchase, fighting the draw of gravity that wants to drag you down, to join the Mars bars, festering at the bottom in some kind of speleological digestive system! And having a tackle sac, being taken on a tour of the cave, just added to the 'challenge'. The round trip we did in the end went: down through the shonky boulder choke entrance and across the Upper Traverse, down Baker's Chimney, down The Canyon, through the S-Bend, across the obscure Lower Traverse, then up Hallelujah Pot and back up to the Upper Traverse. We didn't get to the lower series, or venture down Primrose Way, but both sound really interesting. We had a good trip though perhaps because we were happy to take it easy and didn't expect much, and it was dry, did I mention that? Epilogue : We were joined by a lone caver at one point on his way out of the cave, after a brief chat he disappeared up into the boulder choke, the guide book said not to go that way, I later read it was called the Woggle Press after a scout had been squashed in the boulders! Many years ago. 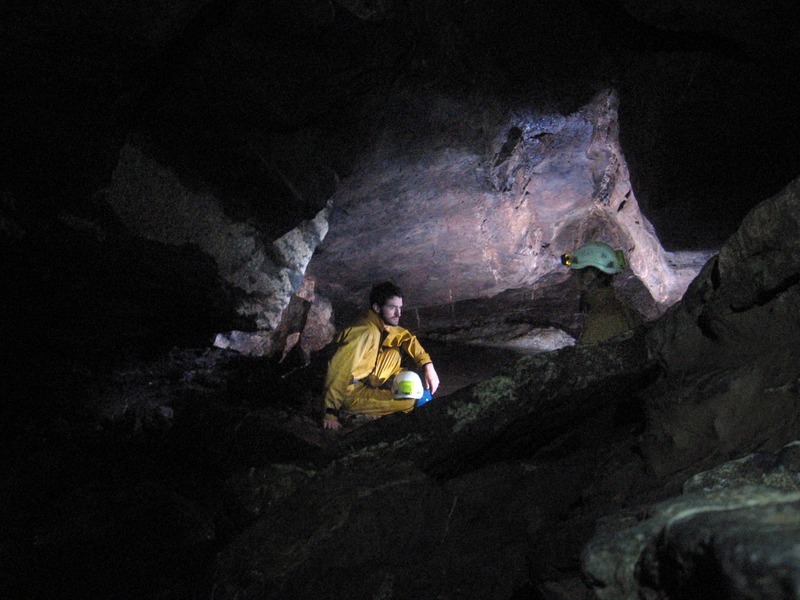 Did anyone see a lone caver exiting the cave...or was it an apparition? After another good fry-up in the morning I went to visit Cheddar with Alex, Thomas, Jonny, Marionette, Dan and Nico instead of caving again. My whole body was aching, in places that have never ached before - solid evidence of the intensity of caving, especially for someone who hasn't done that much exercise (not even that much for anyone else really considering we didn't reach Sump 1) in probably at least five years. gorge towards the village. The view was gorgeous; you don't expect scenery like that in England. It reminded me a little of Norway. In the village we visited the various cheese and cider shops before stopping in at Derrick's Tea Room for - obviously - cream tea. Then we walked back to the cars along the road that wound through the gorge, observing several climbers along the way. I'd like to visit the town again maybe for a weekend. At the hut there was an arduous team clean-up, with what felt like a thousand mugs to be washed and greasy trays to be scrubbed. Inwardly I bemoaned the lack of hot water (the boiler had broken) but eventually all was done, we jumped into the minibus, and with Portishead, Beth Orton and other such tunes playing (and none of Nico's alcohol this time!) we were on the way back to London. Back at Beit we all lugged everything into the stores, and I could feel how much my body was going to ache the next day. Joy! But it's all part of the experience right? Despite having said that it was physically demanding (which it was) and that I felt a bit glum about not being any good at it (which I'm not) I obviously loved something about it because I keep thinking about going again, and I've just written this massive trip report as a well-enjoyed form of procrastination.